ROLL YOUR 401K OVER TO AN IRA! DO NOT CASH IT OUT JUST BECAUSE YOU’RE NO LONGER AT THAT COMPANY! YOU WILL GET SLAMMED BY THE TAXES! When should I roll my 401k over? In this day and age, anything can happen to any corporation at any time. Leaving behind a 401k account out of complacency, negligence, or just downright laziness is a big mistake. What if your former employer merges with someone else, changes platforms or even, gulp, goes bankrupt? It’s your money in that plan account, get it out of there when you leave, just like you would the rest of your belongings! Where should I roll or transfer my 401k account to? 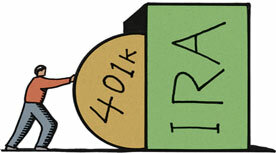 IRA’s are great, and turning your 401k into one is the smartest and easiest move people can make when they change jobs or leave a company. You can open an IRA Rollover account up at just about any brokerage or bank. What can my 401k account bring with it to the rollover IRA account? Let’s first separate two terms that many investors (and professionals) tend to use interchangeably: Transfer and Rollover. Transferring your 401k allows you the option of never having to take physical custody of your funds as they move between your 401k and your new IRA account. This does not get reported to the IRS, so if you transfer it to a broker or firm you aren’t happy with, don’t worry, you still have the ability to move it again within the same calendar year without restriction. This method will allow you to move your securities over (more on this below). With a Rollover, however, you’ll be getting a check from your 401k sponsor after you request liquidation. You will then have the responsibility to deposit this amount into a rollover IRA account within a a certain amount of time (discussed below). You can only do one rollover a year, so be prepared with a destination you can live with for a little while. How long do I have to move the money from a 401k to my rollover IRA? You have 60 days to get the distribution cash reinvested into a rollover IRA or another qualified retirement account. If you are under the age of 59 and a half and do not get this done, you will be subject to the 10% penalty tax, so don’t play games. Have your rollover set up before requesting your distribution. What can I transfer into a rollover IRA? Your rollover IRA account should be able to handle most investment products like mutual funds and index funds. You may have the choice between keeping your investments intact as opposed to just receiving a check for the liquidated value of these securities depending on how your plan is set up. Where things can get tricky is when company stock is mingled with other investments in your account. Fortunately, the percentage of company stock that employees typically hold in 401k accounts has been in decline for most of this decade (thanks, Enron!). If you have earned company stock in your 401k, these shares may be rolled to your IRA but might be subject to capital gains and/or income tax. As I do not offer tax advice for a living, I would simply say that whether or not you choose to keep the stock in your employer’s plan, roll it with the rest of the account into an IRA or take a lump sum distribution will depend on factors like your “net unrealized appreciation” and the method your company uses to determine your cost basis. Because this is the case, I always recommend that people with company stock consult with their accountant to figure out how they want this aspect handled prior to rolling over a 401k account to me. Can I transfer my investments as they currently stand, or do I have to sell everything in my 401k? Many plans currently allow for a “distribution in kind“, meaning you can take your securities to the new qualified account. This is an attractive option for some people because the weightings and allocations they’ve made in their portfolio can stay in one piece. The share amounts and weightings should be unaffected by the transfer, however, keep in mind that your future fund purchases will no longer be automatic. When you make your IRA contributions going forward (assuming you do not get a new 401k with your next employer), your elections will be made manually by either you or your broker. Even if your plan is set up to allow for “distributions in kind”, there are certain proprietary funds or annuities that may not be transferable to your brokerage IRA. This may require you to do a partial “liquidate upon transfer” the more difficult holdings. It is not always possible to do partial transfers, so if you’ve got “unmovable” stuff, the decision to liquidate has basically been made for you. You will have cash once the account is moved equivalent to what was invested in the liquidated asset or assets. This problem is becoming more rare, but a good advisor or broker will check that out for you beforehand so that arrangements can be made. If I do not find a new employer with a 401k, can I contribute to my rollover IRA each year? Yes you certainly can, just as you would contribute to a regular IRA. For 2008 and 2009, the maximum IRA contribution amount is $5000. If you are over 50 years old, you get to make a catch-up contribution of $6000 each year. Your rollover IRA will also be subject to the same Required Minimum Distribution (RMD) rates as regular IRA’s when you turn 70 and a half. I hope this explanation on the rules and benefits of rolling over a 401k into an IRA has been helpful. The rules are tricky, but you usually have just one shot to get it right. Therefore, doing your homework or working with an experienced professional are your only options. Just because things did not work out with a prior employer, do not add insult to injury by triggering a major taxable event for yourself. If you are interested in discussing how I can assist you in this process, please contact me via a confidential email or by phone.